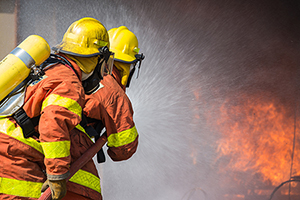 Moose Jaw, SK – In 2018, firefighter cancer was the second leading cause of occupational disease-related fatalities in the province, accounting for 30 per cent of all workplace deaths related to occupational disease. In response, WorkSafe Saskatchewan commissioned a pilot program to gain a better understanding of the current firefighter preventive landscape throughout the province. Findings from the program were presented today at the Saskatchewan Association of Fire Chiefs’ annual convention in Moose Jaw. Working with Jim Burneka Jr., Founder, Firefighter Cancer Consultants, LLC, WorkSafe developed a pilot program in collaboration with several Saskatchewan fire departments to investigate hazards on the job and in fire halls related to the risk of occupational firefighter cancer. Policy reviews, fire station inspections and in-depth interviews with fire department members were included as part of the pilot. Fifteen fire stations (including eight departments) participated in the program, which included representation from both the smaller rural volunteer departments and larger urban career departments. While the majority of fire departments have begun to implement cancer prevention initiatives, the pilot provides guidance on where to focus WorkSafe’s cancer prevention efforts. “It was very evident throughout my evaluations that the firefighters throughout the province were aware of the cancer problem, but were unclear on what steps they could take, or didn’t have the necessary resources to begin implementing new practices,” stated Burneka Jr.
Each of the eight participating departments will receive a report individualized to their fire hall with an action plan on how to address the gaps identified. The practical recommendations of the reports are based upon current practices to ensure that departments implement the best practices known to reduce their members’ risk of being diagnosed with an occupational cancer. The complete findings and recommendations will be made available to all Saskatchewan fire chiefs at their annual convention. WorkSafe will also share the report on their website, and plans to survey more fire departments in the province to confirm the areas for improvement identified in the pilot program.